Curated Cocktails With Ascendant Spirits – Halloween Edition – Extended Hours! $5 signature cocktails from Ascendant Spirits. A freakishly good deal. 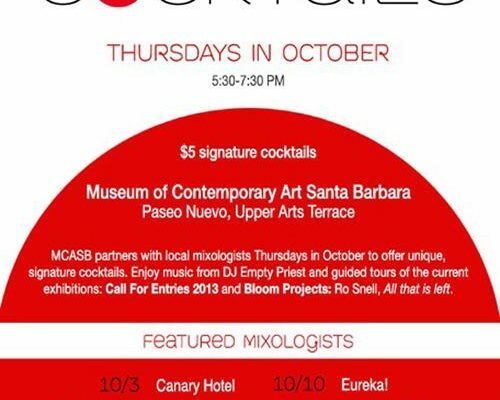 Museum of Contemporary Art Santa Barbara offers music, art, and curated cocktails on Thursday evenings in October. MCASB partners with a new local mixologist every Thursday in October from 6-8 pm to offer unique $5 MCASB signature cocktails. Visitors can enjoy music from DJ Emtpy Priest and guided tours of the current exhibitions: Call For Entries and Bloom Projects: Ro Snell, All that is left. Register for Event: Curated Cocktails With Ascendant Spirits – Halloween Edition – Extended Hours! Your ticket for the: Curated Cocktails With Ascendant Spirits – Halloween Edition – Extended Hours!